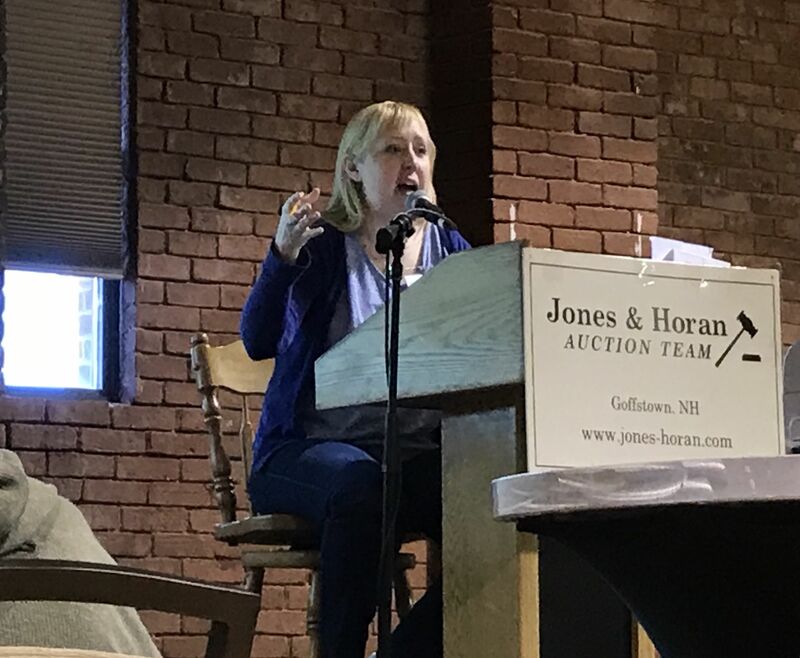 Jones & Horan Auction Team conducts two Live Auction Events per year, and two Online–Only auctions per month specializing in vintage and antique watches, jewelry, coins and clocks. Jones & Horan has been specializing in horological auctions for 35 years! All Jones and Horan auctions are conducted with No Reserves and No Buyer’s Premium, and there is No Sales Tax here in New Hampshire. with Tyler St. Gelais looking on in the background. September 23, 2018 Live Auction Event. In 1945: George F. Jones was the Manager, and eventual owner, of a 200 acre Dairy farm in Goffstown, NH. He allows his customers to barter their milk bills with items found around the house and barn. His son, George E. Jones, develops an uncanny ability to deal within the Antiques market by helping his dad buy and sell the bartered items. In 1983: George E. Jones and Patty Horan get married. Patty quits her teaching job, gets her Auctioneer’s license, and the Jones & Horan Auction Team, Inc is born. In 1985: Tim Decker (1946-2012), a long time friend and founding member, finds a customer who wants to consign his vintage watch collection to one of the Jones and Horan auctions. Soon after recognizing the potential market, the company diverts all its resources into developing a specialty for Horological items. In 1987: Marc Bourque joins the Team as a computer consultant. Marc guides the auction house as it launches one of New England’s first websites onto the fledgling World Wide Web. In 1995: Frank Davis joins the Team as Property Developer. He restores an old barn into a comfortable, efficient office. Nowadays, he heads Inventory Control and is a well-loved consultant on Old Coins and just about everything else. In 2010: Ryan Fields brings his expertise and superior work ethics as a digital photographer to the Team. In 2014: Diana Levesque joins the team full time as Office Manager, Assistant Cataloger and one of the Auctioneers. She is proving to be a gift from above, and now also serves as the Team's Chief Operating Officer. In 2015: Jones & Horan conducts their first On–Line Only auction in January. Soon thereafter, On–Line Only auctions take place twice a month on Thursday, and there are two Live auctions scheduled for the Spring and Fall. Jones and Horan Auction Team sells vintage watches, jewelry, coins and clocks to clients from all over the world with gross sales of about three million. In 2016: Fred Hansen, a second generation watch collector who started at the ripe old age of eight, brings his thirty years of expertise and experience to the Team as Cataloger, Consultant, and Expert in American pocket watches. In 2017: Tyler St. Gelais, jeweler and wristwatch enthusiast, comes on board. His passion for watches delights the Team as well as clients. In 2017: Marc Bourque, who has been working with us part-time for thirty years, joins the Team full-time as our computer consultant. In 2018: Amanda Kelly joins the Team. Patty Jones had been praying for someone who could come close to being as valuable as our COO, Diana Levesque. This young lady (Diana's baby sister!) is an answer to those prayers.